The South Florida Argus Vol. 2, No. 15 issue for January 6, 1886. 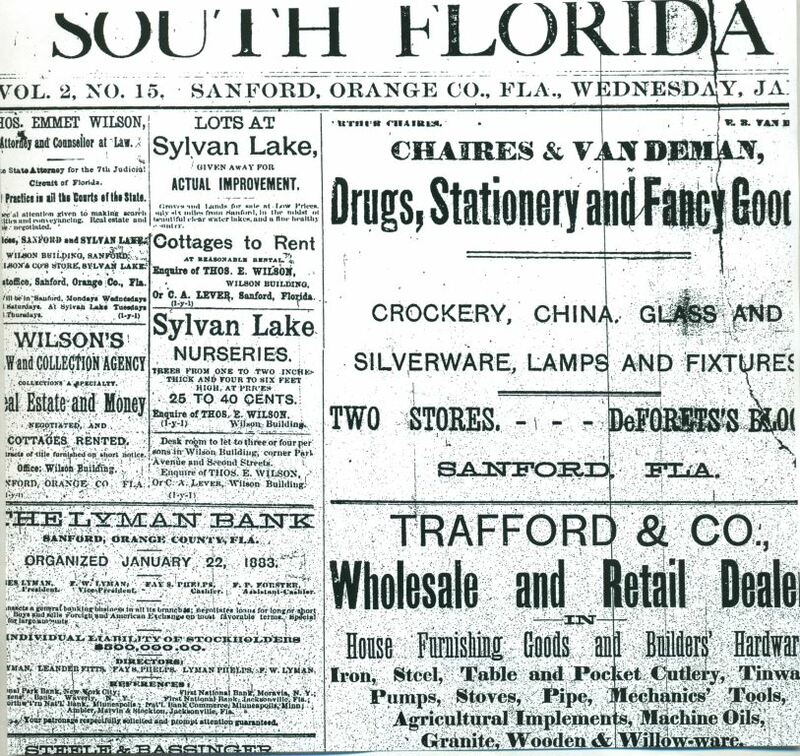 This issue included advertisements for several Sanford-based businesses, including Wilson's Collection Agency, Charles & Vandeman's drug store, the Lyman Bank, and Trafford and Company. The South Florida Argus was Republican paper published by Adolphus Edwards and printed in the Old Fort Reed Building on First Street in Sanford, Florida. The Sanford Journal, a Democratic newspaper, had its offices next door in the very same building. There was, of course, some rivalry between the two papers. After some time, Edwards gave up printing The South Florida Argus to become the local postmaster. Print reproduction of microfilmed newspaper advertisements: The South Florida Argus, January 6, 1886: Microfilm Cabinet, Reel BN06021, Sanford Museum, Sanford, Florida. Microfilmed newspaper advertisements: South Florida Argus, January 6, 1886: The South Florida Argus, January 6, 1886: Microfilm Cabinet, Reel BN06021, Sanford Museum, Sanford, Florida. 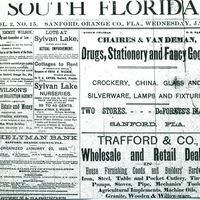 Digital reproduction of printed microfilm newspaper article: The South Florida Argus, January 6, 1886. Microfilm Cabinet, Reel BN06021, Sanford Museum, Sanford, Florida. Originally published by The South Florida Argus. This resource is provided here by RICHES of Central Florida for educational purposes only. Sanford Historic Preservation Board. "First National Bank No. 1 - 1883." City of Sanford, Florida. 2009. “South Florida Argus Vol 2., No. 15, January 6, 1886.” RICHES of Central Florida accessed April 24, 2019, https://richesmi.cah.ucf.edu/omeka/items/show/4292.